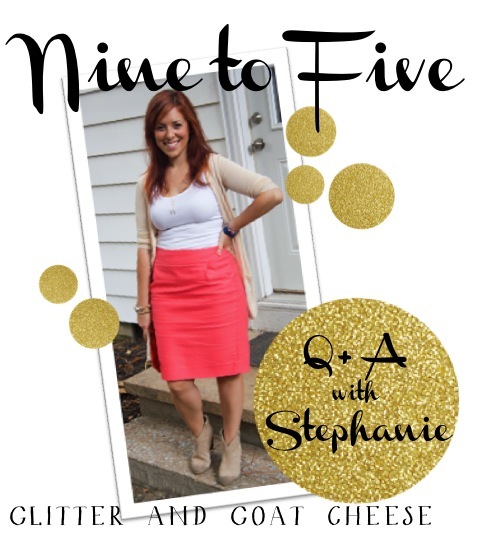 This week's Nine by Five feature is Stephanie of Glitter & Goat Cheese. Stephanie has a great eye for everything glittery and sequins, and does amazing interior decorating in her awesome Atlanta abode. Oh, and girlfriend had an awesome wedding and I occasionally watch her wedding video and cry. And by occasionally, I mean more often than is probably acceptable. Make sure you stop by Shannon's blog to find out the details of Stephanie's adorable outfit! I work for a big entertainment corporation, so the style really ranges from department to department. In my group (the digital editorial group), we're all creatives, so we're pretty laid-back. I find that I start to get depressed if I dress down too often, though, so I really try not to get lazy with my style. Ankle boots, ankle boots, ankle boots! My Ash Jalouse boots are one of the only pairs I can bear in the blazing Atlanta summer, but during every other season, you'll find me in ankle boots pretty much every day. Our campus is huge and I always bring my laptop home, so all the walking keeps me from wearing stilettos. A chunky heel or wedge is a must! I'd like to say it does, but I have to admit: probably not! I'm terrible at compartmentalizing, and I get kind of obsessive with whatever I'm blogging about, so when I'm thinking about glitter art or ghost chairs, I'm thinking about them ALL. DAY. LONG. That makes it really hard to focus on work projects! But I do think blogging makes me more motivated to learn about design and coding, and those are always useful at work, so maybe it's a draw. I've been blogging since high school (any other former LiveJournal addicts out there? ), and I love being able to look back and see what was going on in my life at any given time. I also find blogging to be a great way to meet and connect with people who share your interests. Who knew so many other ladies were as obsessed with gold spray paint as I am? I'm an aspiring runner and wannabe DIY-er -- I love home decor projects and furniture refinishing -- but to be honest, a lot of my free time goes to reading and watching TV. I'm an entertainment junkie! I've been doing a terrible job finding time lately! My job gets really crazy during the summer, so it's been increasingly difficult, but when I'm on my game, I write posts after dinner or on Sundays. If I can get a free minute during the workday, that's when I catch up on other blogs and Pinterest -- so important for inspiration! I'm hoping to buy a house soon, so most of my pins are home decor and furniture lately. But when I do pin to my fashion board, it tends to involve bright colors, chunky hardware, and/or GOLD. I'm dying for a pair of the Bauble Bar Gold Bullet Studs! A big thank you to Stephanie for coming to hang with us today! Nine to Five will be taking a break for the month of August, but we'll be back in September with a whole slew of lovely ladies showing you how to spice up your nine-to-five look! Steph is seriously the coolest person! Best style -- I've been jealous of her hair since Journalism 101 freshmen year of college. i'm sorry. what? there is a blog called glitter and goat cheese AND I DON'T READ IT YET? So much shame on myself. Thanks for featuring this blogger!! Ha! You guys are awesooooooome. Loved this feature! Those boots are fantastic! And the name of your blog is all I need to know in order for me to realize how awesome it is. Love her and her take on blogging is spot on! Thanks for the introduction, Alex! So very happy that she mentions high school Live Journals and obsessing over things she's blogging about :) Love it!! Thanks, guys! I can't wait to read all your blogs -- looove making friends through comments!